As the PTO is soliciting public comment on the potential amendment to the first filing deadline for Affidavits or Declarations of Use under Section 8 (and Section 71), we’ve compiled some analytics on the actual number of renewals for all trademark registrations filed in 2005. We used this basis-year to indicate the general trend, as the 6-month grace period for Section 8 Declarations of Use would have recently expired on June 30, 2012. The data was analysed separately for 3 categories, reflecting the basis of registration; 1a, Home Country, and Madrid. 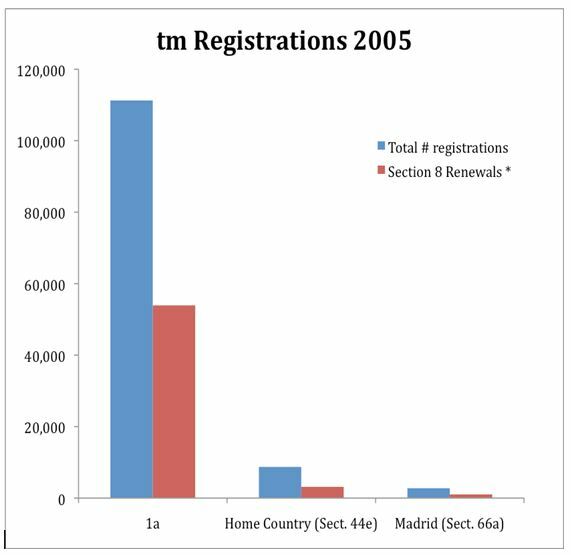 The percentage of registrations renewed is shown in the table and chart below. Is it what you might have expected? Does it make or break the case to amend the Trademark Act to advance the filing deadline to between the third and fourth year from registration? Here are a couple of alternative views to this data. 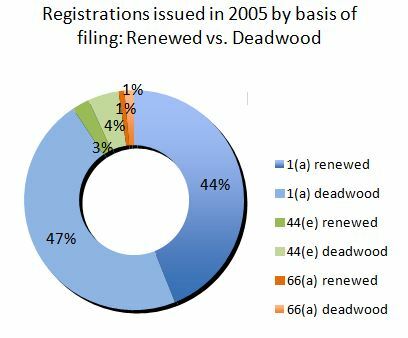 The first one is a representation of all registrations in the year 2005, with the relative percentages of renewed marks vs. deadwood within the register as of June 30, 2012. 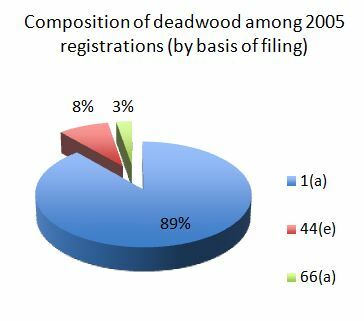 The second chart illustrates the composition of deadwood marks within the register by filing basis, from all 2005 registrations. See our Services page for more info on Towergate’s unique data mining and watch services.